Some of our team participated in the Annual Butler Sales Meeting last month, and we just received this award photo to share it with you. 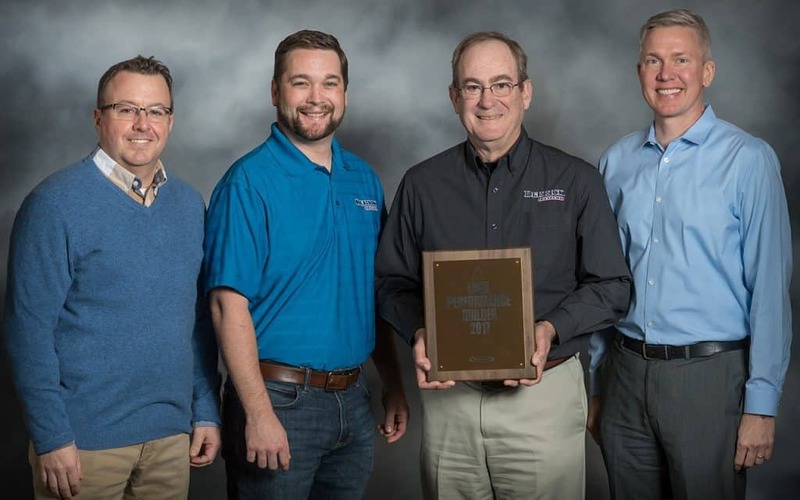 Pictured left to right: Aaron Sundeen, Chad Derrick, and Bill Derrick of Derrick Building Solutions are receiving a “High Performance Builder” award for 2017 from Greg Pasley, President of Butler Manufacturing. Butler Manufacturing™ is a building solutions company providing the design, manufacture, and marketing of metal building systems for commercial construction who partners with regional exceptional contractors such as Derrick Building Solutions. Butler systems play a part in buildings within the commercial, community, industrial, and agricultural markets. And with services such as BlueScope Construction, Butler goes beyond the manufacture of steel building systems by offering full-service turnkey construction solutions through their North American Builder Network, of which Derrick Building Solutions is a part.